Gason Ayisyin was born in la Tortue, Haiti, an area known for its beautiful landscape and proud revolutionary history. 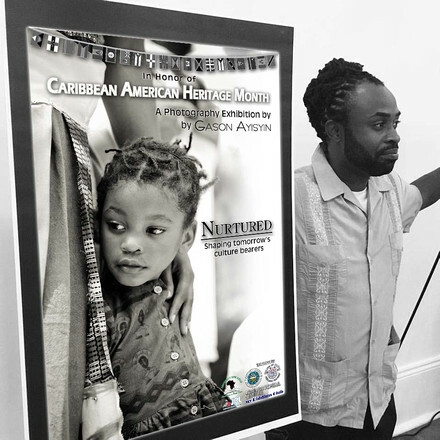 Gason later immigrated to the United States as a young child, settling a close-knit neighborhood in Fort Lauderdale, FL where he sustained a traditional Haitian lifestyle. Throughout his upbringing, Gason’s daily experiences were the sounds of drums, the calls of ancestral spirits, the exaltation of dance, the tastes and smells of traditional foods, and the sights of healing folk medicine. Today, he is informed thru a bi-cultural experience where modernity and custom converge into a unique worldview that values innovation, yet cherishes tradition. ​Gason’s artistic viewpoint immortalizes emotion, quiet thought, and all other expressions of the inner self. Be it a father’s praise or an elder’s gaze, Gason cuts through pretense to expose spirit and the beauty that emanates from such truth.